Excuse me for a moment. I’m a tad delirious and need to share a few thoughts. Actually, it’s just that my eyes need to rest, so staring at the computer seemed like a good idea. I would like to take a moment to address my friends at Mega Bloks. Your product ranks right up there with a set of Chinese finger traps. Seriously. Except I can just throw away the cheap finger traps and not feel bad. I have a 6-year-old looking at me with tears in his eyes, while I feel like a complete failure for not getting his set put together yet. It all started with a well-intentioned aunt. And a Santa that found a great deal on Zulilly. Or so I heard. A set of building blocks…but green and yellow. John Deere. Just like Dad’s. But last time I checked, Dad’s didn’t come in pieces that you had to put together on your own. 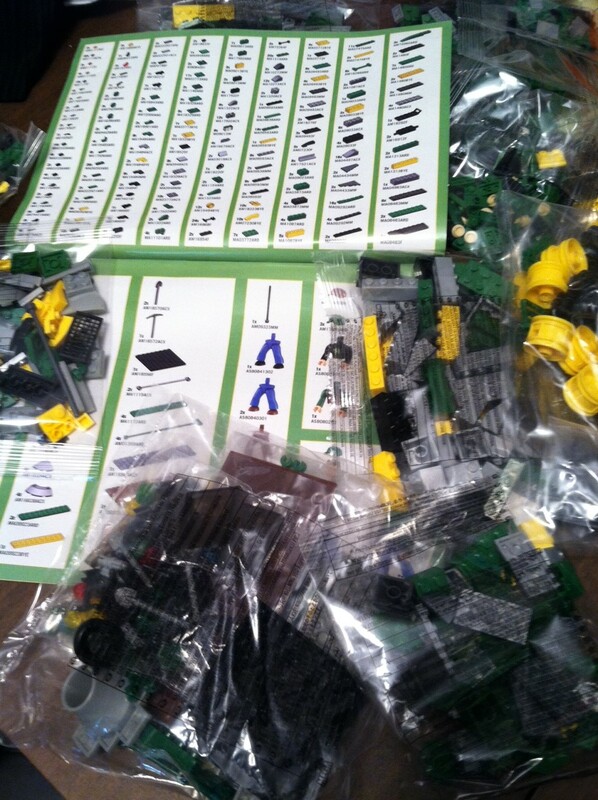 Not only pieces (828 to be exact), but the pieces come in bags. Ages 5+…yeah right. Cool set, not so cool set up. No biggie. Fewer pieces to lose if you have the project separated into bags, right? Wrong. The set is labeled for ages 5 and older. Great! Three out of my four boys can build it without assistance! The youngest is almost there as well, he’ll be able to handle it. My 11-year-old is darn near an engineer. He shouldn’t have a problem at all. Wrong. All three were almost to tears a few minutes in. The problem? The bags mean nothing. You might as well open them all up and pour them into a giant tupperware container to start with..and perhaps a glass of wine. Or two. Don’t put the bottle too far away. Are you kidding me? Please tell me you’re kidding me. They forgot the two most important pieces. Patience and a sense of humor. 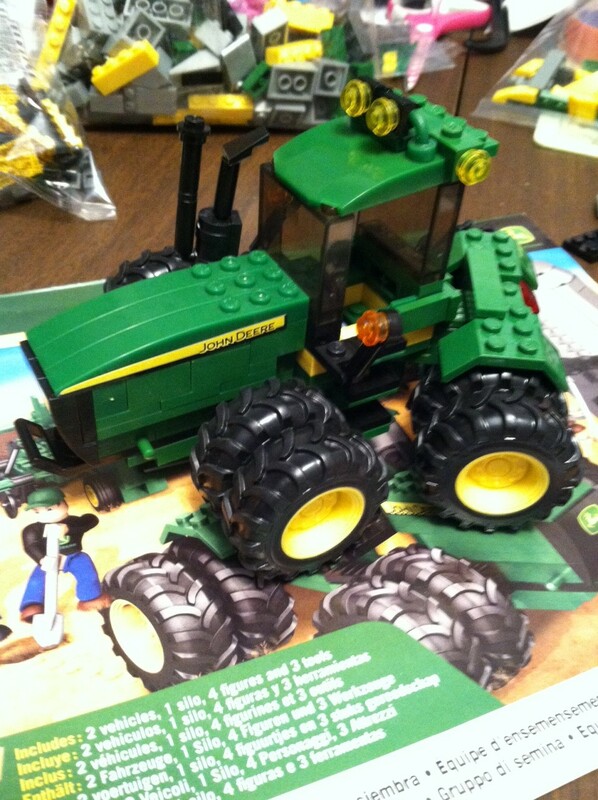 I won’t even tell you how long it took me to build the large tractor. I’m almost ashamed to admit it. It would have been fun, but every time I thought I had it figured out, I had to back up a few steps. And let’s not talk about pieces that were missing. Let’s just say that completion was figured in hours…not minutes. A true sign that I really love my boys. Really. The person in charge of suggesting what age is appropriate for these sets is on crack. “For ages 5+,” yeah right. I do believe the fine print also suggests you have a working understanding of Olde English, hieroglyphics and advanced calculus, as well as a background in engineering…preferably genetic.Oh, and be a member of Mensa. The next person who buys a set of these for my children will also be required to put it together. I have warned my children that these will go on a shelf. If I see anyone touching them, they will be grounded until they turn 475. I’m only exaggerating a little. 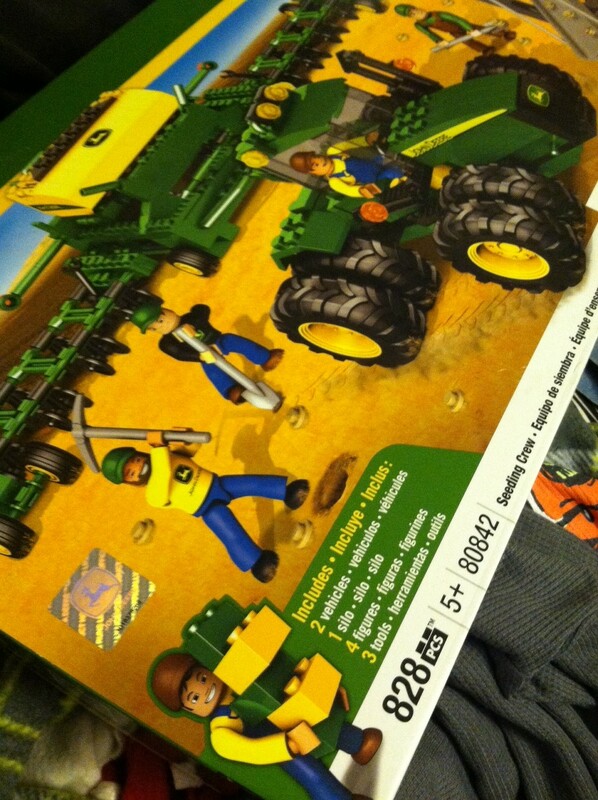 This entry was posted in Boys and tagged Christmas gifts, difficult, Mega Bloks, toys by wagfarms. Bookmark the permalink. hahahahaha, a few years back I bought Logan a K’nex ferris wheel that said 6 and up or something. I think he was maybe 7 or 8. It took me and him many hours to get it together. You are correct, the person who assigns the ages is clearly on drugs or something!! I do have to say though, I bought Logan a couple puzzles this Christmas that were hard on purpose, I wanted them to take him a while so he would stay off the video games a little! And now I have something to buy for my 34-year-old farmer husband! I would suggest a bottle of tylenol…and perhaps a case of beer as well, if he’s into that kind of thing. 🙂 But I finished it today…follow up post coming later! Oh my goodness – We got the same set from Zulily. Just came in the mail today, late of course! My husband and I thought the same thing – we only got the tractor together tonight as well – but it took both of us doing it! I had a good laugh because we were right there with you!! Putting it together in pairs is probably a good thing, that way, when you start seeing double, you can tag out. It would be a GREAT retaliation gift. Really. Truly. This cracks me up. Thanks for future warnings! We’ll stick with Ertl, although they are just about as breakable in their current “plastic” formations! Merry Christmas from http://www.PaintTheTownAG.com ! Yes, Ertl takes over our house as well. Apparently Santa had a momentary lapse in common sense. I’m pretty sure it won’t happen again. Oh, I talk tough, but don’t worry, these sets will definitely be played with. But they won’t be disassembled. I hope. 🙂 My kitchen floor is being farmed as I write!